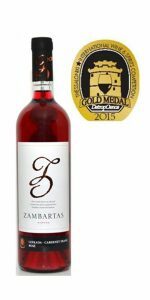 Zambartas Wineries was awarded with a gold medal at the Thessaloniki International Wine Competition in Greece for its Rose 2014. Zambartas Rose was the 3rd best Rose of the competition, with the no. 1 and 2 Rose’s both from Greek origin. Zambartas Rose also received a special mention, being “the best blend of a Greek and foreign grape variety” of the competition. Thessaloniki International Wine Competition is organized under the auspices of the O.I.V. (International Organization of Vine and Wine), with renowned Greek and foreign wine tasters (enologists, sommeliers and journalists) tasting wines and spirits from Greece and abroad. With over 550 samples entered in the competition, Zambartas Wineries is proud that the Rose was judged to be among the top of the competition.